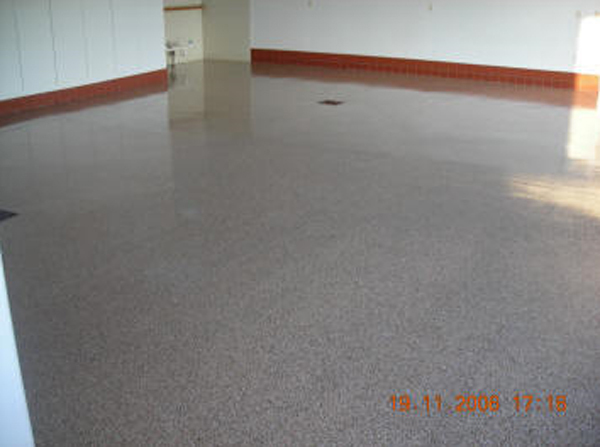 According to, Custom Concrete Design, “If you want the highest grade of 100% solids epoxy, you will want a cycloaliphatic epoxy.” Cycloaliphatic epoxy offers high abrasion resistance, won’t fade or yellow, has no VOCs (Volatile Organic Compounds) and emits no odor after it dries. Depending on the product, there are many color and design choices available. A Base Epoxy Color is added to the Garage Floor First then we can add flakes to the mixture. More flakes in the mix will create a solid color, while fewer flakes result in a flecked design. High-Epoxy gloss is spread on after the Flakes have had 24hrs to settle and get locked into the base coat. Then the Clear High Gloss Epoxy Finish is Applied, then we apply 4 coats of wax to help protect the Epoxy Coat, it really gives everything a nice High Gloss Shine!! Concrete garage floor coatings will resist tire skid marks, and a quality epoxy will not be damaged when it comes into contact with hot tires. Additionally, an epoxy coating will not be harmed by the oil and chemical drips often occurring in garages. 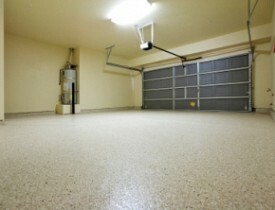 For home and business owners who want to upgrade the appearance of their garage or make it more resistant to stains, chips and cracks, a concrete garage floor coating offers all of those advantages.